If you followed comics in the ’90s, you’re probably familiar with the chief complaint levied against upstart publisher Valiant: all Valiant comics looked the same. To its credit, Valiant was aware of this criticism and even mocked it in house ads in 1995, which featured new pin-ups of new titles with the text “Valiant House Style?” over top. But when the Valiant relaunch was announced, comic readers familiar with the Valiant of old immediately wondered if the new Valiant would be as beholden to a general style. It was a fair question, but now that we’re a few years in it seems safe to say that Valiant has done a lot to win over new readers looking for another option outside of the Big Two brand of superheroics in part because they’ve launched with titles that are pretty disparate in aesthetic and tone. This week saw a particularly exciting shift from general expectations of a Valiant comic with the launch of Jen van Meter and Roberto de la Torre’s The Death-Defying Doctor Mirage, which has its roots in a second wave ’90s Valiant title but is more or less completely reinvented here. Decked out with a Travel Foreman cover and a Venture Brothers-like logo, Doctor Mirage is one of the more stylish Valiant releases since the relauch, especially once the story gets to a point where Torre is allowed to show off his impressive artistic range. Torre is an artist with abstract leanings, but there’s substantial emotional weight to his storytelling; rather than fall back on the crux of barely there faces and overly shaded backgrounds, Torre uses his sharp penciling to call attention to the expressions of his characters, allowing Meter’s story to be more emotionally believable than it would have been with a more utilitarian artist. That’s important because Doctor Mirage is yet another in a long line of new paranormal investigator comics, with the twist being that Doctor Mirage is something like a paranormal therapist, who pays the bills on her magically protected house by doing group therapy sessions with widows and their dead partners. 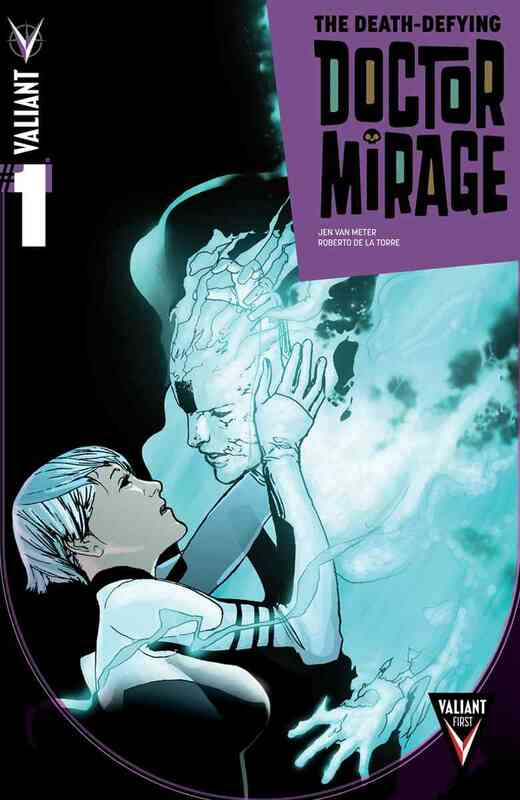 Of course, it’s made clear that this isn’t the life Mirage has always lived, she’s more or less on the run from her own shadowy past and the mysterious fate of her husband, but this debut issue makes a point of crafting an intimate counterpart to the more action oriented original Doctor Mirage series. Many of the new Valiant series have featured a kind of smarmy, mocking tone in their reconfigurations of superhero tropes and cliches, but Doctor Mirage’s emotional focus helps it further stand out from any kind of Valiant house style. Like a million other supernatural stories, there’s a subplot about Nazi fixations on the occult and a looming battle with an intriguing kind of personal demon, but Meter has a clear passion for the character she’s writing and the emotional toll this kind of work takes on her. Meter connects Mirage to the very real psychological trauma people who work with the dead face and that refreshing approach to a dangerously oversaturated genre makes it much easier to connect to the story. Torre might not get any opportunities to craft some action oriented scenes in this first issue, but he and colorist David Baron nonetheless manage to give the issue some kineticism through vivid shifts in color, mood and perspective, as well as a lot of hazy detail in the scenes where Mirage is brought out to consult with a semi-retired occult hunter with a unique problem. Meter’s storytelling and Torre’s artwork also recalls Jeff Lemire and Travel Foreman’s New 52 Animal Man, which took a similar approach to its title character, focusing on his issues keeping his homelife grounded and helping others in need. Though nothing in this first issue is quite as imaginative as Foreman’s approach to the mystical characters of The Bleed, Torre really brings Meter’s depiction of a phenomenally weird occult oriented domesticity to life. 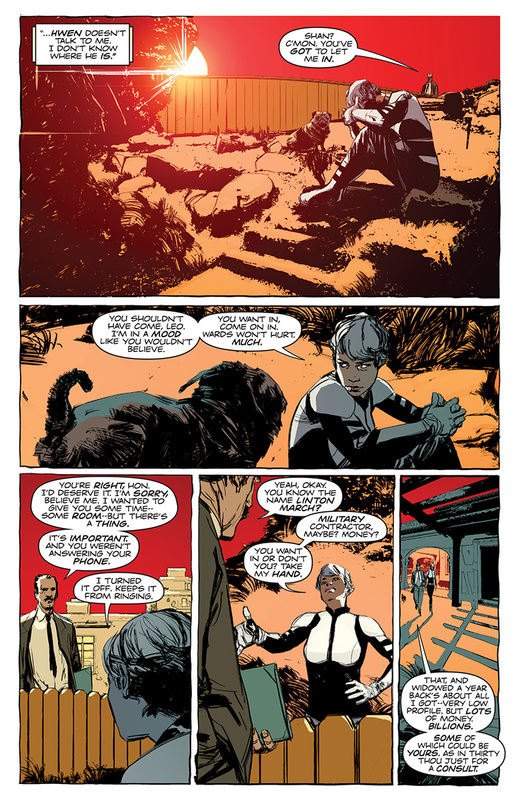 Doctor Mirage is set to be a five issue miniseries, but you get the feeling that the creative team has thought out every corner of Doctor Mirage’s world and could easily take a Witch Doctor approach, with later miniseries following other cases Doctor Mirage has explored. 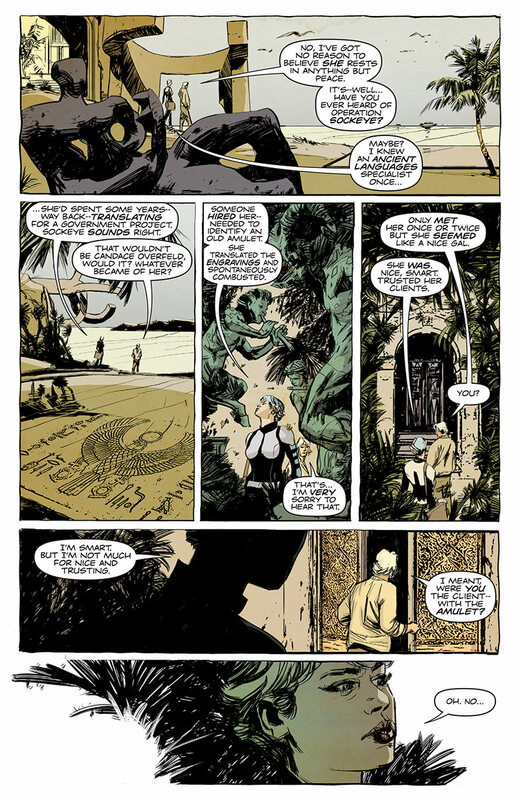 Regardless of its eventual fate, though, The Death-Defying Doctor Mirage is one of the more notable new Valiant titles, featuring a creative team in peak form (this is easily one of Jen van Meter’s liveliest scripts, full of sharp, noir-infused dialogue and well thought out characters) and a thoughtful perspective on the supernatural investigator subgenre. It’s also ample proof that Valiant is continuing to position itself as a bold publisher willing to carve out new ground in the often staid superhero genre. As far as Doctor Mirage is concerned, the “Valiant House Style” is just doing your own thing, expectations be damned.